Yesterday I paid a quick visit to the University of Liverpool to chair a fascinating lecture by Wim Jansen of the University of Amsterdam, who has carried out a corpus-based comparison of the Esperanto of 1903 with that of 2003. He showed that over the intervening century some Esperanto affixes have acquired a life of their own: for example ege, from the augmentative suffix -eg-, was unknown a hundred years ago but is now a significant rival to tre (very) and multe (much). Anyhow, on my way through the town, as I walked back to the station, I was intrigued to see a hairdresser’s punningly called Ben Hair. It took me back. Those who remember Cilla Black (a Scouser) from the television programme Blind Date will recall that she was forever introducing girls called klɜː or ˈsɜːrə. 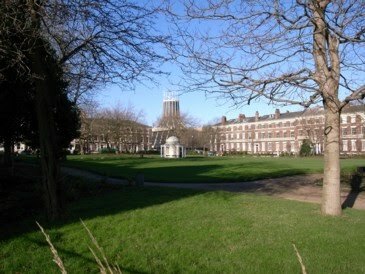 My picture shows Abercromby Squɜː with part of the University and one of Liverpool’s two cathedrals. Somehow I was unaware of that merger. I ask because in the Home Counties we had ˈθrɪpn̩i ˈbɪts, or even ˈθrʊpn̩i ˈbɪts. I suppose I must have heard the song, as I found I had the tune in my head, but a google revealed the Spinners singing "In my Liverpool home…" (not even "me L home") and to my disgust all the rhymes were in ɛə. But I have a feeling that the tune was not theirs. May I call on your choristry for any enlightenment on this? I've heard Liverpudlians pronounce the merged vowel as a front vowel as well others using a central one, as in "wɛːz mi ʃɛːt" and "ðə ˈdʒɛːmənz bɒmd ɑː ˈtʃɪpi". I've no idea whether the difference represents anything, though. I have always guessed it was a hypercorrection. And now I guess John will have something to say about this. mostly a hypercorrection, that is. Alternatively it may be a question of how Liverpudlian you want to be, given that you have a whole spectrum of available realizations for your merger. – I ask because in the Home Counties we had ˈθrɪpn̩i ˈbɪts, or even ˈθrʊpn̩i ˈbɪts. Well no science can ever be exhaustive, but where is everyone? What about ˈθrʌpn̩i ˈbɪts? We at any rate had those too! I am (was) familiar with ˈθrʌpni and ˈθrɪpni bits, but personally I call(ed) them ˈθrepni bits. Sili, that poll is American-oriented only. All Brits distinguish all those vowels, so the poll is completely uninteresting from our point of view. ... pronunciations such as nɛːs might be looked on as hypercorrections. Well, Morgan-Mar is Australian, and what I'd 'missed' was the inclusion of "Murray" in the list - or rather I didn't understand it at the time. Maybe other people aren't as big Beatles fans as I am, but I've been aware of the Liverpool SQUARE-NURSE merger ever since I heard them rhyme aware and her in "I've Just Seen a Face". It sort of figures that Paul would be the hypercorrector, doesn't it? This merger occurs on the east coast of Yorkshire as well, although strangely the vast area between there and Liverpool (including Manchester, Leeds, Bradford) does not use the merger. In Hull, Middlesbrough and all the smaller places along the east coast, [ɛ:] is used in both sets. "I have always guessed it was a hypercorrection since seeing it in Accents of English." No one for ˈθrʊpn̩i bits? Sili, the inclusion of "Murray" was what I'd missed too. But it does tie in with the Northern California shift of fən towards fεn, doesn't it? 2s ld is of course right. Or 2/1d. You seem to consider yourself targeted by JW's "Question for the young: how much change would I have got from half a crown?" And judging by the foregoing, perhaps he wanted it in phonetics. These threads dry up so quickly that I'll do it myself in case anyone is young enough not to know, and interested enough to want to: tuːənəpeni. @mallamb: No, it's not in Accents of English, although there is a mention of the merger in Lincolnshire (p.361) and it wouldn't surprise me if it extended across the Humber to Grimsby, etc. It wasn't in the SED data either, which suggests that it might be a recent innovation on the Yorkshire coast, or it might've been confined to the urban areas at the time. It is unlikely to have anything to do with the SQUARE-NURSE merger of some accents in England, as the stressed vowel of 'Murray' is STRUT, which all English accents I'm aware of distinguish from NURSE; Scousers and Yorkshiremen alike distinguish [m3:r\i] (or [mE:r\i]) and [mUr\i]. So now we see that myrrhy should have been included in the survey. And Marie (in the traditional pronunciation) maybe. For what groups do you think that might enter the picture? It would be a bit difficult to specify the "traditional pronunciation" without being so specific as to compromise the study! No, I think not. I meant (the equivalent of RP) /ˈmɑːrɪ/. Yes I know you did, but would the subjects? No idea. Probably not, and asking for obsolete pronunciations is not the approach of first choice in field work.